Oldemor si søster, Bertine Marie Hagen født 7 NOV 1890 Snillfjord, Hemnskjel, Sør Trøndelag, dro til Duluth Minnesota 1910. Eg har søkt vis My Heritage og her i emigrasjonsprotokoller, passasjerlister osv her på Digitalarkivet. Eg får alltid "0" i søkeresultat. Kan nokon hjelpe meg med å spore Bertine Marie i Minnesota? Tips på Kordan søke riktig..
Tusen tusen takk for hjelp ! 1910 316 35 4980 1 20.07.1910 Berntine Marie Knuds. ug Sypike k 1890 Hevne Duluth, Minn. Dominion Aaro Bill. bet. i Amerika a Att. Takk!! Korleis søker eg riktig for å spore ho i Duluth, Minnesota? Har ikke funnet henne i Amerika. Såvidt jeg kan tyde så skulle hun til Christian M? Hansen, 3823 West 6th Street, Duluth, MN. May C. Larrabee, 78, Lodi, Wis., formerly of Duluth, died Sunday, Dec. 17, 1995, in a Madison, Wis. hospital. She was born in Duluth to Christ and Marie Knutson Hanson. Her husband, Norman Sr., died on Jan. 27, 1971. She is survived by a daughter, Christine Ness of Lodi; five sons, Norman Jr. of Lake Mills, Wis., James of Waterloo, Wis., and Richard, John and Tom, all of Lodi; 13 grandchildren; and five great-grandchildren. Services: 10:30 a.m. Wednesday in First Lutheran Church in Lodi. Burial will be in the Dekorra Lutheran Cemetery near Lodi. Arrangements are by Hamre Funeral Home in Lodi. Hazel A. Hanson, 86, of W. College St. died Thursday, Dec. 25, 2003 at St. Mary's Medical Center. A Duluth resident the majority of her life, she was born in Duluth on Aug. 6, 1917 to George P. and Ethel A. B. (Loven) Peterson. She was a 1936 graduate of Duluth Central High School, and a graduate of Duluth Business University. Hazel worked as a secretary for various Duluth architectural firms. She was a member of Trinity Lutheran Church since 1956. She enjoyed playing cards, working crossword puzzles, and jigsaw puzzles. She was preceded in death by her twin sister Helen as a child, her great grandson Brian Bonte, and by her husband Herbert A. on January 29, 1995. Survivors include her children Beverly (Robert) Konkler of Pine City, Minn., Kenneth (Carolyn) Hanson of Waxhaw, N.C., and Kathleen Hanson of Mystic, Conn.; her sister Joyce (Walter) Hamski, and her brother George (Marti) Peterson, both of Houston, Texas; five grandchildren, and seven great grandchildren. Dette er over all forventning!! No blir mamma glad. Hjarteleg, Egil! Age 57, passed away on Saturday, at St. Mary’s Hospital. He was born in Waterloo, Wis., the son of Norman and May (Hanson) Larrabee. He married on June 28, 1980. Har sendt deg en PM ,med navn på nålevende etterkommere. Egil, korleis finn du desse nekrologane, f. eks. den frå 1995? I am a grandson of Bertha Hanson, the sister of Chris Hanson mentioned in this topic. Chris died in 1963 in Minnesota, when I was 10 years old, but I never met Chris. Chris immigrated into the USA in about 1900, and Bertha immigrated to the USA in August 1904. Chis was born in Hemne, Sør-Trøndelag, Norway. 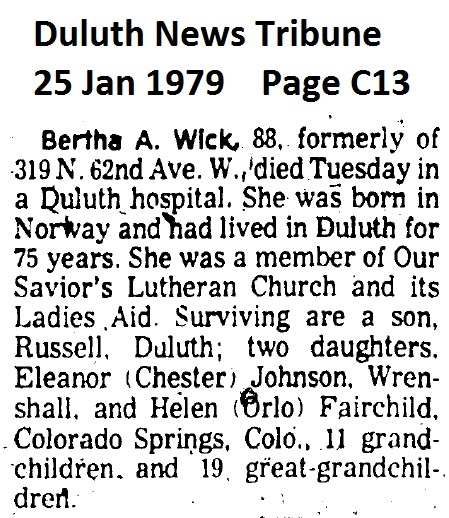 Bertha was probably also born in Hemne, but I could not find the arkivverket record for her. In Norway, their names were Kristoffer Martin Hansen (born 23 Sep 1879) and Beret Anne Hansdatter (born 26 Sep 1890). Their parents were Hans Mathiassen born 23 May 1849 in Hemne, and Elen Olesdatter born 16 April 1851 in Hemne. One place they lived was the Snækvik farm in Hemne. Hans died before the 1900 Norway census. 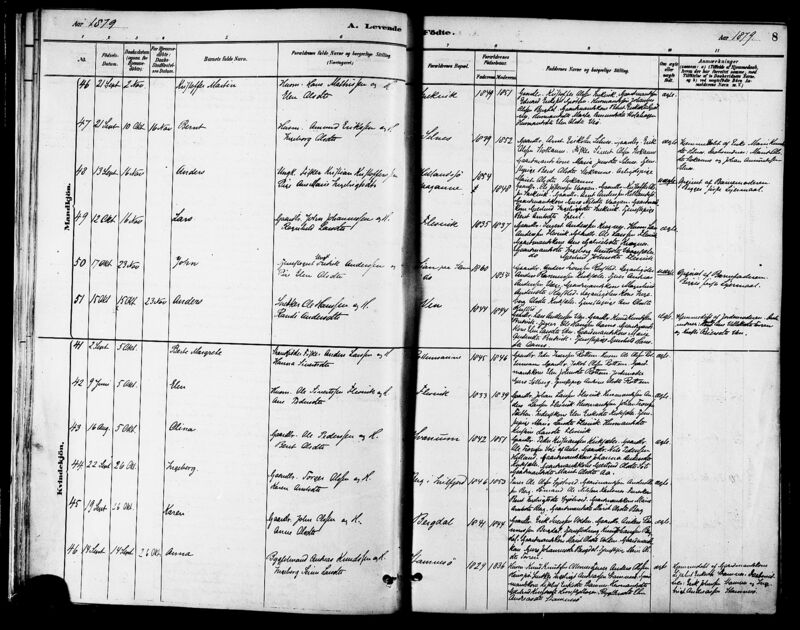 Elen immigrated to the USA in 1904, and married Lars Olson in 1907, which explains the census mentioned above in #7. I believe that Marjorie E Hanson (daughter of Chris Hanson) married Duane F. Moore on 9 September 1939 at the Our Savior's Lutheran Church in Duluth, Minnesota. Since Bertine Hagen (wife of Chris Hanson) was also born in Hemne, I am interested to find out if the two families knew each other in Norway before immigrating. I traveled to Norway last year, but did not travel to Hemne. Please let me know if there are any questions I can try to answer about this family. Dear Randall! I am so Sorry for not answering this fantastic message instantly!! The weeks went by with busy chores and the haste before christmas just took the time that I REALLY wanted on reading this information! Dear Tove, Thank you for the response. I have since found more information about the family. There were important clues from the online database of the local genealogy society in Hemne, Sør-Trøndelag, Norway, as mentioned above in this string. The website for that group is www.hemneslekt.net, and they have a large online database of the local families. Here are hyperlinks to the the www.findagrave.com pages where I have been adding information concerning this family. Bertha Anna Hanson is https://www.findagrave.com/memorial/185785787/bertha-anna-hanson. The mother of Bertha Anna Hanson and Chris M. Hanson was Ellen Olson https://www.findagrave.com/memorial/73225470/ellen-olson. I am still working on those pages, so they do not yet have all the information I have been collecting. I hope this is helpful to you. My name is Kathleen Hanson. My father was Herbert Hanson, son of Marie B. Knutson Hanson and Christ M. Hanson. Randall Wick was kind enough to direct me to this website, and I am wondering if the Jenny you refer to Tove, is Jenny Sivertson who I met when I visited Hemnskjel in the 1980’s. I’m also wondering if I am related to any of you: Tove Skudal, Egil Johannessen, or Ann-Mary Engum since all of you have been actively seeking and posting information about my grandparents. I am grateful to each of you for all of the information you’ve found and would love to share anything that I may know. I also have some questions. I hope to hear from someone. Kathleen Hanson, there You are!!! My mother Unni Sivertsen and Aunt Snefrid Sivertsen have talked about for years the time someone came to Jenny’s birthplace to visit.. My mum remebered that so few of them spoke any english at all, and that she was afraid the norwegian family didn’t welcome You as well as they should have!! Oh my, no. I was welcomed with open arms and gracious hospitality. My memories are not entirely clear, but there was a professor of some kind that was vacationing on the island and they asked him to come act as interpreter. He joined us on a walk around the the area near the house. Gunlaug (spelling?) and Alfred had me spend the night, I had a delicious fish dinner and despite the language barrier, we were able to communicate somewhat. As I recall, Gunnlaug’s sister Jenny and her husband happened to be visiting at that time, and then Gunnlaug’s daughter-in-law (Oliv?) and granddaughter (Jorun?) came over to visit with me as well. A few years later, someone sent me a short story that somebody had written about the visit which I was able to have translated. I still have it. Unfortunately, I lost touch with everyone after that. I have some photos of your mother, Snefrid and your Grandmother. I also once received a letter from Line Ellingsund who said her grandparents were Jenny and Sverre Sivertson. Any relation to you? I also received a letter from Oliv Peterson who I believe was Gunnlaug’s daughter-in-law? I also have a photo of my Grandma Marie with (I think) her sister Ida. Your Grandma Jenny was wonderful about sending photos to my Grandma, several of which I have. You may be in one of them. Do you know anything about Oliv or Jorun? Yes, my Grandma went by Marie once she arrived in the United States. She also always told us her maiden name was Knutson, so I’m guessing Hagen was the name of the farm?